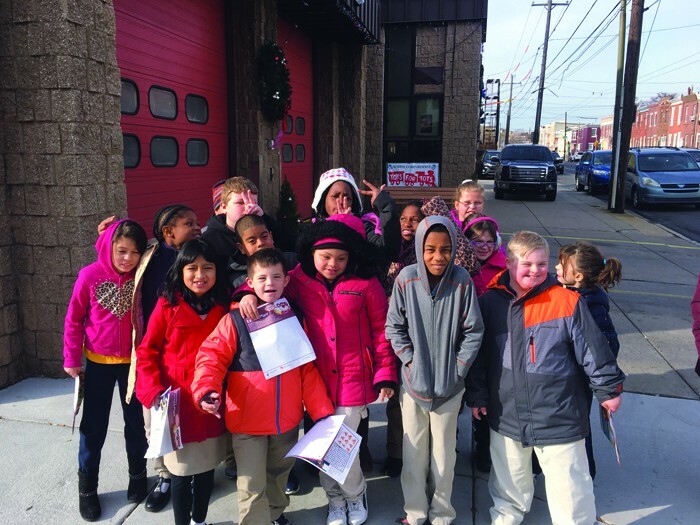 Members of Tina Pierandozzi’s life skills class at Sharswood School beat back against the cold by flashing wide smiles outside Engine 53. In her role as a life skills teacher at George W. Sharswood School, Tina Pierandozzi loves building the self-esteem of the 18 third- through fifth-graders in her care. The Lower Moyamensing resident also helps the intellectually disabled youths to foster an attitude of gratitude toward their personal heroes and local difference makers. On Dec. 13, the charges shared the joy of the holiday season with members of Engine 53 by preparing peanut butter and jelly sandwiches for the Whitman-based personnel. Enjoying her first year at the public institution based at 2300 S. Second St., Pierandozzi, 24, formerly a pre-kindergarten teacher at Our Lady of Hope Regional Catholic School, has been able to call upon her employment to strengthen a lifelong friendship with Frank Andrew, a fifth-year presence at the fire station located at 416 Snyder Ave. When she suggested a visit from her students, he and his brethren accepted the idea “with open arms,” and the children pondered how to display their admiration. The fifth-grader also reveres firefighters and professed an interest in joining the department, so he revelled last week in his classroom constituents’ trip to ShopRite, 330 W. Oregon Ave., to purchase the sandwich components and bananas. As Pierandozzi offers guidance in, among other areas, understanding the importance of independence, the youngsters enjoyed the excursion and the preparation and inspired a few laughs from their leader. Last week’s occasion marked the second time this year that the alumnus of Ss. Neumann-Goretti High School and Neumann University has shown support for civil servants. On July 17, she and more than 2,500 participants biked 65 miles in the Irish Pub’s 29th annual Tour de Shore to secure financial assistance for children in need and the families of fallen first responders in the Greater Philadelphia and South Jersey areas. The Whitman occupant and his peers have established a fruitful bond with Sharswood, with Andrew noting frequent interactions with the student body, including a Career Day stop in October that saw the registrants spraying hoses and drawing smiles from the guests. For last week’s venture, fate intervened, keeping Andrew and other figures from fraternizing with their admirers due to an emergency. Despite that, the children, having adorned the offerings with Christmas trees and candy canes, enjoyed every moment of the journey to the space, their time among the protectors, and the reflective return to their second-floor class. Such a demeanor makes Pierandozzi glad every day that she decided to pursue special education as her vocation. Honored to join with the parents of her pupils, a few of whom have Down syndrome, in reminding them that they have “someone to be behind them at all times,” the devout Catholic prays each day that she can be a tireless and tenacious advocate for their immersion into everyday society. That mentality paid off a few days ago when she led the learners in a talk about plunging temperatures, becoming especially animated, to their delight, when Shaylique Davis, yet another fifth-grader, declared her love for the cold.